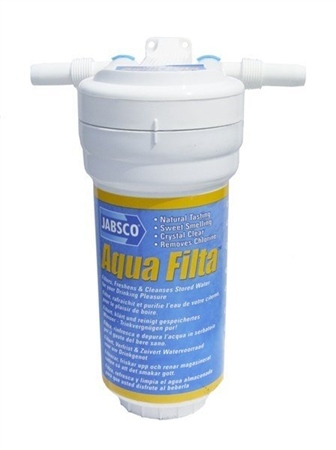 For bright, clean, fresh tasting drinking water onboard, you should really consider using Jabscos Aqua Filta. It is known to remove tastes and odours including chlorine and easy cartridge replacement after one seasons use - no need to disturb pipework. Features and Specifications -Internal Valves - no need to isolate or drain system when replacing cartridge. -Silver impregnated active carbon inhibits bacterial growth. -Connections: - for 13mm (½") bore hose or 15mm Hep2O or ½" BSP internal threaded fittings. -Dimensions: - 230mm high, 140mm deep, 100mm wide. -Output: - up to 14 litres/minute. -Max. Recommended Pressure - 4.2 bar (60 psi).